Researchers have combined 3D holographic lithography and 2D photolithography to develop a 3D microbattery suitable for large-scale on-chip integration with microelectronic devices. Microscale batteries can deliver energy at the actual point of energy usage, providing capabilities for miniaturising electronic devices and enhancing their performance. “This 3D microbattery has exceptional performance and scalability, and we think it will be of importance for many applications,” said Paul Braun, a professor of materials science and engineering at the University of Illinois at Urbana-Champaign, US. As sensors, wireless communication devices, personal health monitoring systems, and autonomous micro-electromechanical systems become smaller, there is an increasing demand for miniaturised integrated power sources. Although thin-film batteries are well suited for on-chip integration, their energy and power per unit area are limited. Three-dimensional electrode designs have the potential to offer much greater power and energy per unit area. However, previous efforts with 3D microbatteries have led to prototypes with solid electrodes, and therefore low power, or mesostructured electrodes not compatible with manufacturing or on-chip integration. With the new 3D microbattery, the mesostructured electrodes are fabricated by combining 3D holographic lithography with conventional photolithography, enabling deterministic control of both the internal electrode mesostructure and the spatial distribution of the electrodes on the substrate. The resultant full cells exhibit impressive performance – a conventional LED is driven with a 500-μA peak current (600-C discharge) from a 10-μm-thick microbattery with an area of 4mm2 for 200 cycles with 12 per cent capacity fade. 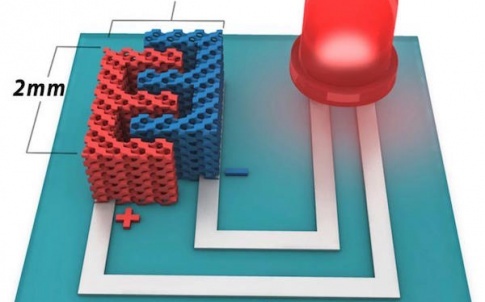 “In this project, we developed an effective method to make high-performance 3D lithium-ion microbatteries using processes that are highly compatible with the fabrication of microelectronics,” said Hailong Ning, a graduate student in the Department of Materials Science and Engineering. Ning is first author of the article Holographic Patterning of High Performance on-chip 3D Lithium-ion Microbatteries, published in Proceedings of the National Academy of Sciences. The work merged important concepts in fabrication, characterisation and modelling, showing that the energy and power of the microbattery were strongly related to the structural parameters of the electrodes such as size, shape, surface area, porosity, and tortuosity, Ning added. “A significant strength of this new method is that these parameters can be easily controlled during lithography steps, which offers unique flexibility for designing next-generation on-chip energy storage devices,” he said. Enabled by a 3D holographic patterning technique, in which multiple optical beams interfere inside the photoresist, creating a desirable 3D structure, the battery possesses well-defined, periodically structured porous electrodes, which facilitates the fast transport of electrons and ions inside the battery, offering supercapacitor-like power. “Although accurate control on the interfering optical beams is required to construct 3D holographic lithography, recent advances have significantly simplified the required optics, enabling creation of structures via a single incident beam and standard photoresist processing,” said John Rogers, a professor of materials science and engineering.